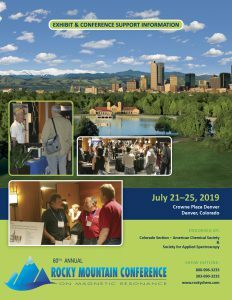 The 60th Rocky Mountain Conference on Magnetic Resonance will take place July 21-26, 2019 at the Crowne Plaza Denver hotel in Denver, Colorado. This event is endorsed by the Colorado Section — American Chemical Society and the Society for Applied Spectroscopy. Workshops, technical papers, posters and vendor exhibits highlight this annual event that attracts worldwide participation of scientists and students from corporate, government and university sectors. The Rocky Mountain Conference on Analytical Chemistry, Inc. is a non-profit corporation, qualified to accept support of this conference, that may be tax-deductible to the entity providing support. The Conference Support items below are considered tax-deductible, however you should consult your accountant and regulatory authorities for final determination.